The perfect solution for weathered, worn, or damaged pool decks, driveways, and indoor and outdoor floors. Offered in an endless array of colors, patterns, and textures, including faux stone and tile designs. Slip resistant, heat resistant, and Class A fire rated. Mold, mildew, and stain resistant – easy to maintain. 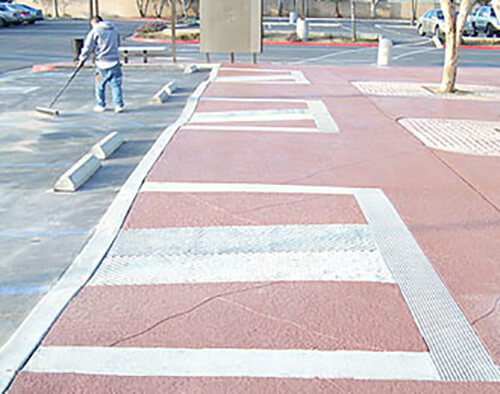 Tuff Kote Systems provides premium quality decorative finishing for pool decks, driveways, and interior and exterior flooring systems throughout Orange County and the greater Los Angeles region at very competitive prices. During our over 25 years in business, our company has serviced thousands of satisfied residential and commercial clients throughout our service area, and has a well-established reputation for providing excellence of craftsmanship and personalized customer service. At Tuff Kote Systems, our beautiful and durable decorative finishes are the ideal solution for revitalizing weathered, worn, or damaged pool decks, driveways, and interior and exterior floors. They are easy to maintain, because they are mold, mildew, and stain resistant. In addition, they are formulated to be stronger than conventional concrete, and provide a long-lasting, protective finish which strengthens the structural integrity of pool decks, driveways, and interior and exterior flooring systems while at the same time, transforming them into a striking design accent. Our decorative finishes are available in an endless array of colors, designs, and textures, only limited by our imaginations and those of our valued clients. Our popular smooth decorative finishes can be installed in an extensive selection of colors, and we also install textured finish designs such as knockdown and orange peel. We can use overlay templates to create the latest "faux" stone, brick, and tile designs, including cobblestone, flagstone, slate, granite, marble, herringbone-pattern tile, and Spanish tile paver looks. But our decorative finishes are not just beautiful, they also provide safety: They possess a Class A fire rating, and are slip resistant – an important feature for pool decks and flooring, and will help protect your family, employees, patrons, and guests against injury from slips and falls. In addition, our decorative finishes are also heat resistant, and will remain comfortable to the touch when exposed to direct sunlight on hot, sunny days. Rely upon the decorative finishing professionals at Tuff Kote Systems, for long-lasting, premium quality decorative finishing systems backed by excellent warranties. We provide estimates to all of Orange County and the greater Los Angeles region, and accept Visa, Mastercard, American Express, and checks. Call us today. Tuff Kote Systems is licensed, bonded, and insured.